MacKay walking along the East Fork of the Lewis River in SW Washington. 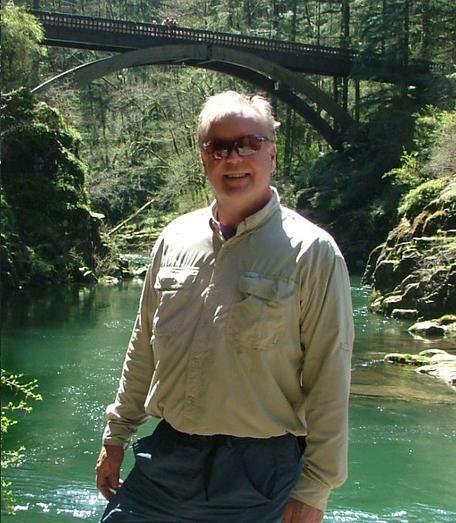 Bob MacKay is a professor in the physics and meteorology departments at Clark College in Vancouver, WA, teaching courses in introductory physics, physical science, and meteorology. He also teaches courses in environmental modeling and Earth’s climate for Washington State University (Vancouver). His past research interests include climate modeling and understanding the dynamic connections between atmospheric chemistry and climate change. Over his 30 year science education career he has developed many interactive learning experiences for his science students. Recently he has been exploring online delivery through hybrid courses using a format of face to face lab and online “lecture”. Students explore the increase in atmospheric carbon dioxide over the past 40 years with an interactive on-line model. Online lab activity to explore the generic structure of a leaky water tank. Time delay and equilibrium are introduced. This online game activity introduces students to Earth's radiative energy balance. It also explores the use of a simple climate model in the attribution of climate change. Earth's Thermostat module engaged my introductory meteorology students in actively learning about energy flows and balances within the Earth system. Our module units help my student learn by analyzing data using the methods of geoscience. Systems thinking in relation to Earth's energy balance climate and society is also a central theme of our module.